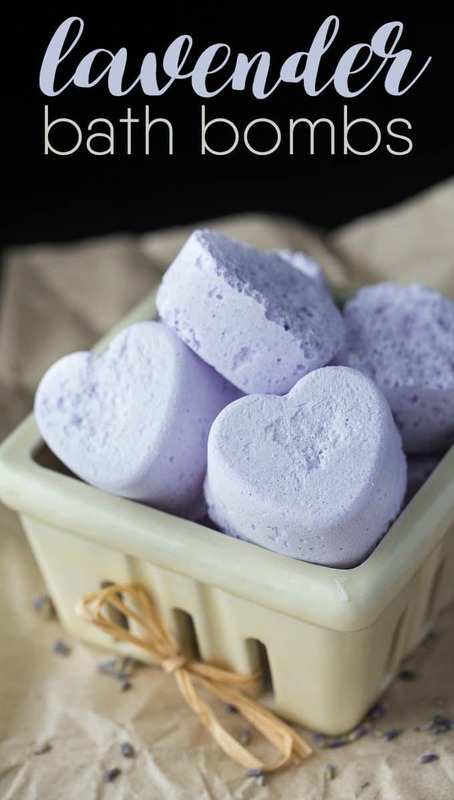 I shared these Lavender Bath Bombs on my Facebook profile recently and had a great response. I even had someone ask if I took custom orders because they wanted to buy some bath bombs from me. I don’t sell them and explained that I make them for my blog. My goal here is to teach you how to make them yourself. Sell them, keep them, give them away as a gift – they are yours to do whatever you like with! Typically, bath bombs are circles, but I hadn’t received my bath bomb molds yet from Amazon so I used a silicone mold instead. I used a heart shaped silicone mold and think they turned out better than expected. Mix the baking soda, citric acid and cornstarch in a bowl. Add in the lavender essential oil and purple soap colorant and mix. Spritz with a spray bottle filled with water and stir. Repeat until the mixture resembles wet sand. Press into a silicone mold and leave at room temperature to set for at least 8 hours. Carefully pop out of molds and enjoy! Bath bombs are so easy to make. You need baking soda, cornstarch and citric acid for your base. Then add in your favourite essential oil and soap colorant to make them pretty and smell nice. I used purple soap colorant and lavender essential oil here. To use, add them into your bath water and enjoy the fizz. I find them so relaxing to use! If you love DIY beauty like me, make sure to check out all my other homemade beauty recipes and follow along because I have many more to come! You might also like this Lavender & Magnesium Soak. Your Lavender Bath Bombs are so pretty and I have never made bath bombs before. I need to make these and put in my bath. I bet they feel very soothing on the skin. My sister loves bath bombs and recently spent a small fortune on some at a craft fair. Thanks for this post becasue I am gonna make her some for a Christmas gift. Saving to my green recipes board, these look wonderful! Our To grandma’s house we go link party starts over at our place tomorrow morning, would love to see you there! 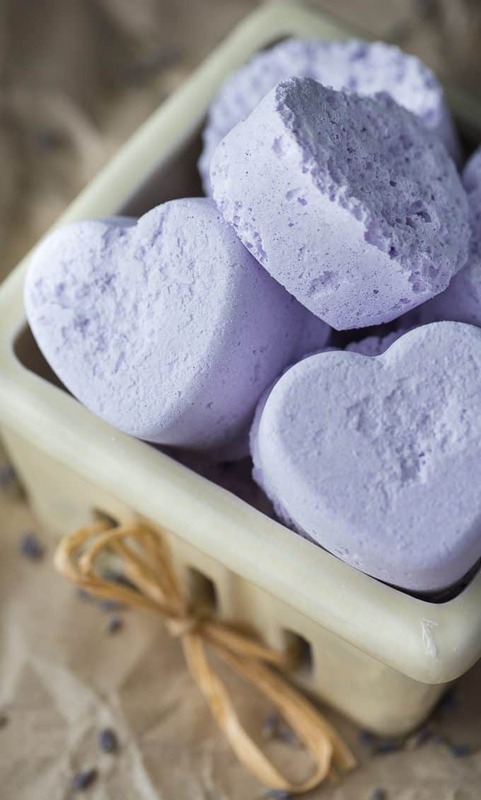 I love lavender and your bath bombs look so pretty, I have to try it myself. I love lavender incense and i bet these are wonderful in the bath! They would cost a lot less to make than buy as well : ) Thanks for the recipe! I think they’re much cuter with the heart shaped molds! Thanks for sharing the recipe. I’ve been wanting to make some. Stopping by from the This is How We Roll Linky Party. Have a great weekend! Can’t wait to try these – pinning! You’re a mind reader Stacie! I’ve been wanting to make some of these for teacher gifts this Christmas and there you are, linking your post up at last week’s Thriving on Thursday. Perfect timing. I’m featuring this post at tomorrow’s party. How many will this recipe make?? I am so excited to make these, especially for my little guy who loves bath bombs! Quick question? How many did this recipe make?? When you say soap colorant, where would you find that? I’ve seen other recipes use food coloring. Also, where do you find the citric acid? Pingback: The Best DIY Bath Bomb Recipes! Pingback: How to Make Bath Bombs and Scrubs for DIY Gifts - Perfect for Mother's Day!